The Husqvarna 120 II Petrol chainsaw is an easy to use, all-round chainsaw for homeowners. 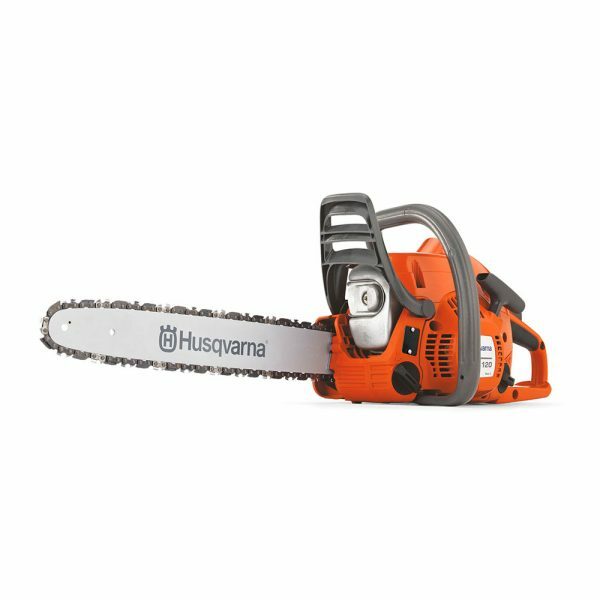 Thanks to sufficient cutting performance the saw makes light work of cutting firewood, light felling or limbing. Features X-Torq® engine technology for low emissions and Air Injection that keeps the filter clean. Low kickback cutting equipment for increased safety. Excellent saw, even better service!! A1 service.absolute professional. Very impressed and will definitely use again. Great product, great service, great price, delivered next day just what was needed thank you very much I will be using you again. The saw for the money is brilliant I’ve used it for 3 days solid apart from chain coming of once cannot fault it nice little machine and pretty powerful. Simple chain adjust, easy fluid(s) fill, cold start choke simple and reliable operation, starting easy when engine cold or hot……and it cuts quick and cleanly. Arrived quickly and has proved to be more than capable of the jobs I have used it for very happy with it. I would recommend this saw without hesitation. Tried it today for the first time and I was very surprised how good it was. Price was very good and delivery next day excellent.